Fossil amber from present-day Myanmar – commonly called Burmese amber – continuingly yields amazing new discoveries. 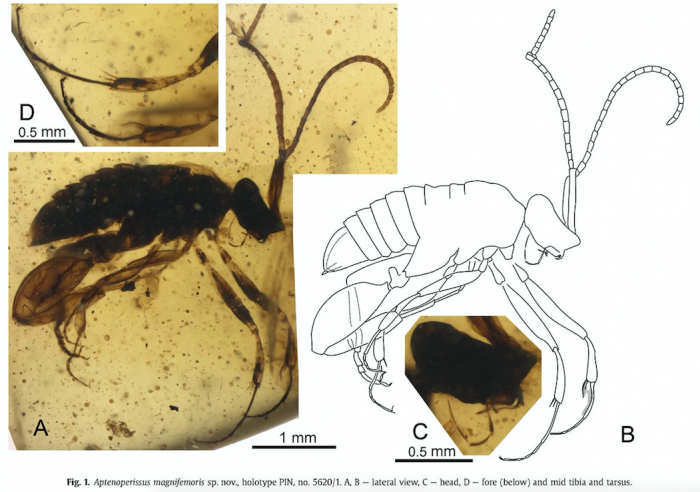 Among these are three new wasp species with bizarre, hybrid morphology, showing body features of ants, wasps, beetles, and grasshoppers. The recently discovered three new wasp species were just discovered a few months ago and are from the extinct family Aptenoperissidae. The family gets its name from its the lack of wings of its females (apteno) and their extinct status (perissus). The antennas of Aptenoperissus are geniculate and polymerous, as, for example, seen in ants. Their bodies have no wasp waist and are heavily sclerotized, similar to beetles, while their hind legs are incrassate and equipped with strong muscles such as grasshoppers have, but the females also have needle-like ovipositors. These body features allowed them to jump if they had to flee and to find their hosts, in which the females laid their eggs with their strong stingers. We do not know yet which insects they used as hosts. During the Cretaceous, enormous changes in plate tectonics took place on earth. Among these, the Indo-China group of plates, of present-day India and Northern Myanmar, slowly moved across the Tethys ocean towards the north, eventually colliding with the proto-Asian mainland. These fundamental tectonic processes are still going on today, causing on one hand the Himalaya to continuingly rise due to the subduction of the colliding plate, but also causing severe problems along the Sunda Arc, where the Indo-China plates slide along the Eurasian plate, causing vulcanism and earthquakes of tremendous impact (just remember the recent devastating earthquake-caused tsunamis and the earlier eruptions of the Krakatoa in 1883 and the Tambora in 1815, resulting in economic troubles all over the world). Now, the research we conducted focused not only on describing three new species of the bizarre family Aptenoperissidae – these three new species are Aptenoperissus pusillus (of tiny size), Aptenoperissus magnifemoris (with especially big femurs, see figure 1), and Aptenoperissus etius (resembling the movie character E.T., hence the name, see figure 2) – but we also took a greater view on the species, families, and orders of insects which have been discovered so far in the highly species-rich Burmese amber assemblage. Our overview shows that a vast number of these only occur in Burmese amber, and, therefore, are endemic to the West Burma plate and form an insularity syndrome, which suggests that the biota were geographically isolated at the time. The family Aptenoperissidae is also interesting in its unexpected diversity; we know now eight species from just nine fossils, all species only occurring in Burmese amber. Through U-Pb zircon dating of the rock matrix, the Burmese amber assemblages recently were dated to 98.79 +/- 0.62 Mio. years of age. In context of our definition of the Burmese amber biota as endemic, this means that the plate was still not connected to proto-Southeast-Asian mainland at the time. Most theories so far placed the plate collision at an earlier point in time. However, recent research by C. Heine et al. (Reconstructing the Lost Eastern Tethys Ocean Basin: Convergence History of the SE Asian Margin and Marine Gateways, in: Geophysical Monograph Series 149, p. 37-54.) and M. Seton et al. (Global continental and ocean basin reconstructions since 200 Ma., in: Earth-Science Reviews 113, p. 212–270), based on marine magnetic anomalies and geological data, is congruent with our research results, which infers that the West Burma plate (today’s Northern Myanmar) was an isolated island for a long time, about 140 Mio. years. 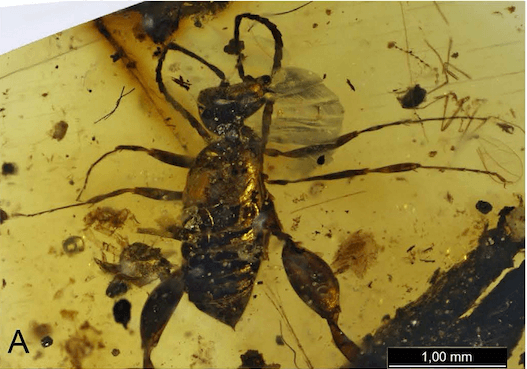 These findings are described in the article entitled Three new female Aptenoperissus from mid-Cretaceous Burmese amber (Hymenoptera, Stephanoidea, Aptenoperissidae): unexpected diversity of paradoxical wasps suggests insular features of source biome, recently published in the journal Cretaceous Research. This research was conducted by Alexandr Rasnitsyn from the Russian Academy of Sciences Moscow (Paleontological Institute) and Natural History Museum London, and Christoph Öhm-Kühnle from the Eberhard Karls University Tübingen.